Enjoy a tasty treat that's been transported all the way from the sidewalk vendors of Hong Kong with the Cucina Pro Bubble Waffler. 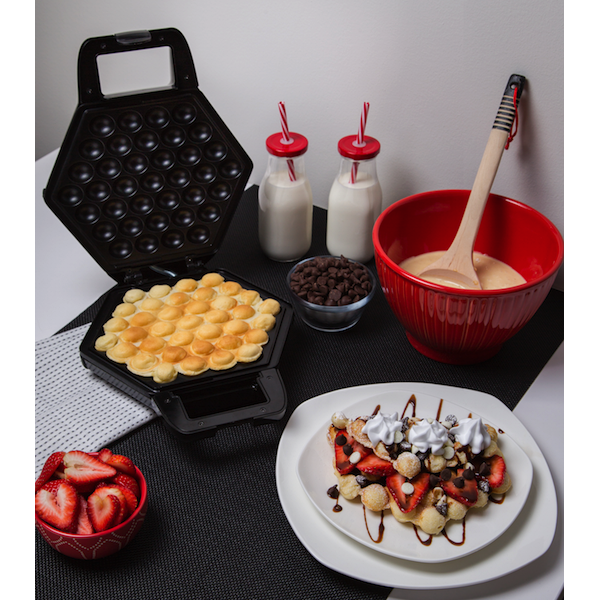 This unique waffle maker creates a large hexagon shaped waffle which has a one-of-a-kind bubbled texture. These delicious waffles, sometimes called egg waffles or "eggettes", have crispy golden outsides and light, tender interiors. An eggette is a kind of spherical pancake or ball waffle popular in Hong Kong and Macao. The food item is also referred to as an "egg puff", "egg waffle", "bubble waffle" or by its Cantonese name, "gai daan" and is made from eggs, sugar, flour, and light evaporated milk. They are best served hot, and often eaten plain. They can also be served with fruit and flavors such as strawberry, coconut or chocolate. They are sometimes referred to as "Hong Kong cakes" in Chinatowns across America, especially in New York. Eggettes are one of the most popular Hong Kong "street snacks" and they have been a favored street snack in Hong Kong since their emergence in 1950s where they were made with coal fire and sold from street kiosks. They are made from a sweet batter that is cooked in a special frying pan with small round "wells" (resembling an ebleskiver, but with smaller and rounder wells) and then set on hot coals in the fire or more commonly, on an electrical heat generator. The egg batter is poured over the special frying pan and heated, thus forming the small ovals of eggettes. In addition to the conventional "egg taste", they are also available in a variety of flavors such as chocolate, green-tea and ginger, etc. Eggettes can be eaten at different times of the day depending on local tradition.